How was your New Year’s Eve? We grilled steaks and had a champagne toast when the ball dropped….which was 9 pm here. My son who was getting ready to start his evening just laughed. Oh well, it works for us. 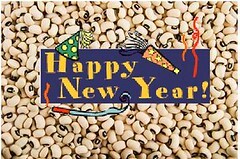 We started the year off yesterday with Hoppin’ John and cornbread to have good luck all year! After revisiting 2010 goals and setting new ones for this year, I decided to make January a no-spend month. I’ll update my progress each week so you know how close I am to my monthly goal. Are you a basketball fan? Well, there a personal finance blog version of March Madness hosted by Free Money Finance and I’m participating. Check out the brackets and be ready to vote for me when I’m up. Don’t buy that tax software yet because PF Stock is giving away 5 copies of H&R Block at Home. No Editor’s picks today because there were so many great posts reviewing the past year and making plans for the next. How do you pick one over the over? Instead I’ll share with you a couple of resolution round-ups to get you started. They might give you some ideas! Welcoming 2011 With Goals and Resolutions is at Consumerism Commentary and includes yours truly. Joe Taxpayer shares his 2011 Resolution Roundup. West coast? 😉 Thanks for the mention! Yes, we’re on the West Coast. One of the benefits is we don’t have to stay up late for Monday Night Football OR to watch the NYE ball drop in NYC! Thanks, Buck. I’ll be reporting on progress each week. Semalee, we’ll see how it goes. I feel that we’ll do well. Thank you for linking to the PFStock 2011 Tax Tips Giveaway. Thanks also for submitting your tax tip. Good luck in the drawing!